Indigenous nations across the USA mobilized to protect Standing Rock. There are thousands of people now standing their grounds, including over a hundred Nations from across the Continent. Tara Houska, from the Ojibwa Nation, says this gathering of tribal nations at Standing Rock is unprecedented since Wounded Knee in 1973. The Standing Rock Sioux Tribe opposes the construction of the Dakota Access Pipeline, because it crosses sacred grounds within the boundaries of the reservation and threatens water sources in the larger region of the Missouri River. There was no prior consultation or authorization for the pipeline. In fact, the construction of the pipeline is a blatant violation of treaty rights. The territorial and water rights of the Standing Rock Sioux Tribe and the Cheyenne River Sioux Tribe are protected under the Treaty of Fort Laramie (1851) and the Sioux Nation Treaty at Fort Laramie (1868)—as well as subsequent treaties. "I can tell you that on the ground people arent leaving. The 2,000 now upwards of 4,000, when folks come in that actually live on Standing Rock, they come in on the weekends were talking a massive encampment of Native American people that are saying no more. And those people we know how to camp. We know how to live off the land. We know how to be in a winter camp. There are people from all over that have come there to bring their skills and bring their tribal cultural knowledge to share with each other. And these folks are not leaving. They want this pipeline; this has become more than just a pipeline. This is a stance for indigenous rights. 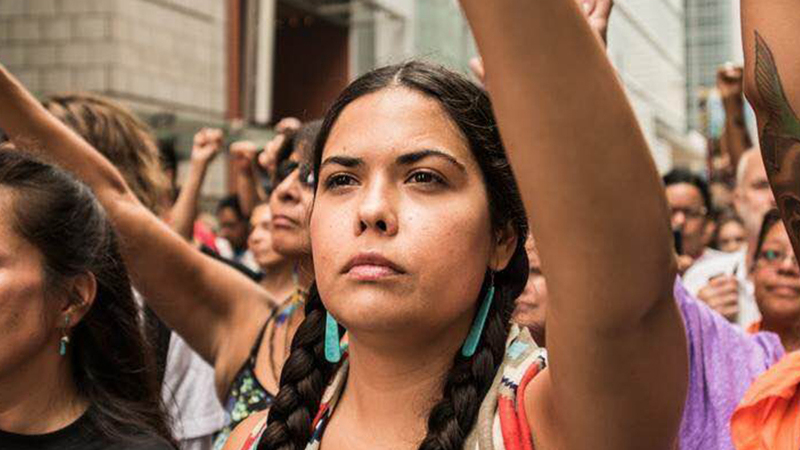 These people are willing to die to stop this pipeline." said Tara Houska. Responses to "Enough is Enough: Indigenous activist's powerful speech becomes internet sensation"
Before the Wounded Knee chiefs went to the UN in ’73, representatives of the Traditional Hopi Nation had also attempted to communicate a message of warning to the world community via the UN on behalf of the Future Generations. The warning is now a present reality. The horizon of Climate Chaos exacerbated by carbon emissions of industrialized society is upon us with every season, where there is no normal in the weather patterns any longer, and the arctic ice sheets accelerate their demise in the north. In this fight to revere, uphold, and defend the ability of Earth to be the Mother to the Future Generations, the Right of Mother Earth to continue being our mother, we stand in solidarity and commitment with the Oceti Sakuwin and the Standing Rock Sioux Tribe, demanding an immediate halt to all construction of the Dakota Access Pipeline. I only caution, to not make this about 'Native' - that is a trap of separation. Stay in Unity. 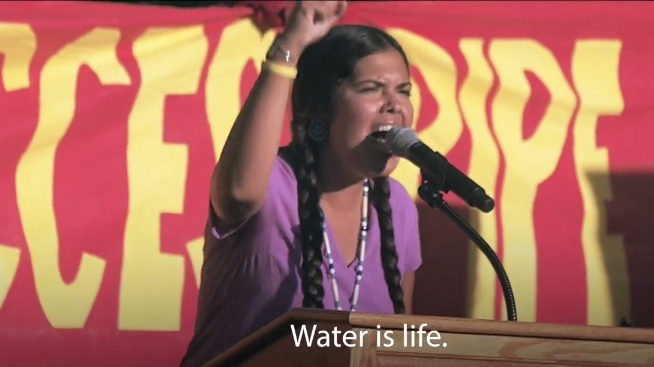 Yes, this is about all people, all water, and the 7 generations of all. I am white this life, but was Native in a past life. I share the Native teachings because I recognize them as truth, but I also find wisdom in other traditions. I wrote a book to talk of healing, "Motorcycles, Madness & Miracles - A Badass Journey to Empowerment" to stop the abuse and ensure clean air, water, and food for the children. Water is life. I stand with you from California!!!! I am only 1% Patawomeck, but I 100% behind you. The Patawomeck were one of the earliest tribes to be savaged by the European guests. 1666 In June, the Council of Maryland made a treaty with the Susquehannock Tribe and received from them two captured sons of the King of Patawomeck. In July, the General Council of Virginia declared war on the Patawomecks. Most of the men were killed. Most of the women and children, who were not already living in English families, were captured as slaves. the Indigenous humans of Canada need your voices too! Premier Christie clark, Prime Minister Justin Trudeau and BC Hydro have ignored reconciliation and denied the Indigenous humans on their own territory at Peace River by continuing to build agigantic hydro dam.they have no concern for Mother Earth or the animals and humans living there! the Site C dam will destroy a huge part of Mother Earth that is vital togrow food to hunt to live the Indigenous humans and all other humans need your help to stop our government and force them to keep their promise. consultation and consensus before any more fossil fuel is removed from Mother Earth Please before she destroys us all! Enough is enough, is Enough is Enough! Please save their lives. please send your voices of Enough is Enough to Canada too Chief Wilson needs to rally every Nation, territory and tribe to join him in his fight before it is too late.Mother Earth commands us to save the peace River from disaster. ,,,I am for protecting earth and leaving resources that are still in the earth alone,,,,have had and held same belief many, many years! Here is good news about a company called Joi Scientific that can undercut the price and replace the need for oil, coal, nuclear energy and natural gas. Water in the rivers, ground, ocean, brackish, polluted or even water in the air can become a zero pollution fuel that turns back into purified distilled water on demand. If Tribal Nations partnered with Joi Scientific located at NASA's Kennedy Space Center they would be able to sell exported zero pollution fuel and lowest cost electricity at the same time providing endless sources of clean water for all. So true and powerful! And the truth is disgusting! Stand strong and my family in Australia are on your side! Solidarity from us here in Far North Queensland, Australia. We are watching, and we commend the solidarity of the North American Indigenous Peoples, and your bravery and resilience and persistence.